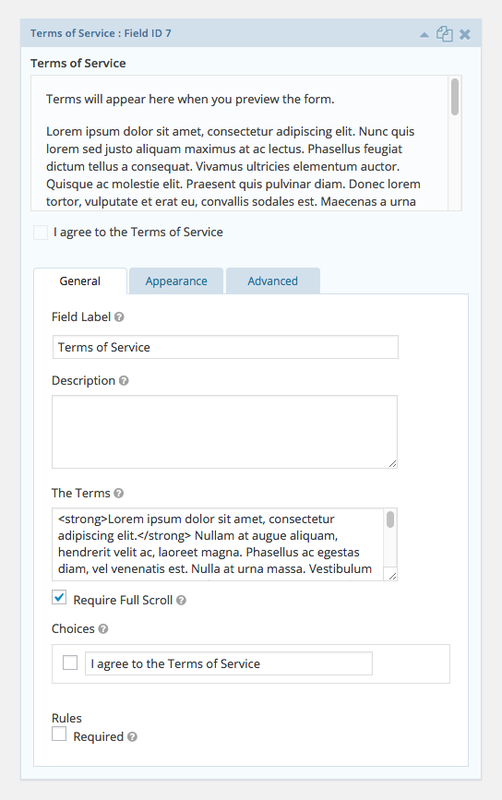 Add a “Terms of Service” field to your form and require full scroll and checkbox agreement. The Terms of Service Field perk allows you to add a new “Terms of Service” field to your Gravity Forms form. You can add the Terms of Service field to any of your forms just like any other field. There are a few extra options available for this field including HTML support, shortcode support and requiring the user to scroll all the way through your terms of service before agreeing to them. Go to the Form List page. Click the form title or the edit action below the form title to navigate to Form Editor view for the desired form. Click the “Advanced Fields” group on the right hand side to expand it. Click on the Terms of Service field button. This will add the Terms of Service field to your form. Open the field settings for this field and enter your terms into the setting labeled “The Terms”. Save your form and preview. You now have a Terms of Service field ready for action! The Terms of Service field supports full HTML and shortcodes for your terms. You can add headers, lists and other formatting options with simple HTML. If you would like to require that the user read the terms, enable the “Require Full Scroll” option. When enabled, the checkbox to agree to the terms will not be checkable until the user has scrolled to the bottom of the terms field. By default, only the value of the checkbox field is included in notifications confirming that the user did agree to the terms. If you would like to include the terms as well, just add the “:include_terms” option to the merge tag. Do you have a Terms of Service page and would like to reuse the contents of this page for the Terms of your Terms of Service field? This is possible using the Post Content Shortcodes plugin. Just install and activate the Post Content Shortcodes plugin and use the [post-content id=""] shortcode to pull in the contents of your Terms of Service page. Added support for translating checkbox label with WPML. Added future compatability with the WYSIWYG CKEditor plugin. Fixed issue where the ":include_terms" modifier was not working after conversion to GF_Field class. Updated plugin name from "GP Terms of Service Field" to "GP Terms of Service"